You go through things and scream and cry and lament them all but some things, some very important things build on top of each other and ultimately shape the kind of person you become. Its not always good, but it is a fact of how things work. I am a liberal. Flaming if you must. In a political science class in college we took a test “Are you a Democrat or a Republican?” and on a scale of 1-10, Jane Fonda is a 1. My score? A ZERO. Not even kidding, I came up further to the left than Jane Fonda. Sit with that a moment. I also am a long time military brat. From birth to about the age of 35, I lived much of that time on a military base, either as a dependent daughter or dependent spouse. I lived in West Germany prior to the wall coming down and went to school with armed guards riding on my bus. There were bomb threats. There were deaths because of bombs. I learned before the age of 14 that you had to look under your vehicle for “suspicious packages.” Fast forward to my adult life and I know the panic the sound of a doorbell can incite. I have seen the multiple cars pull into my street to ring those bells and deliver the news of the death of a loved one. On 9/11 I was promptly locked in on post where I lived in Hawaii and my dad in Texas was sent to New York to help rebuild communication systems there for the government. It took weeks and it was both sad and stressful. Many moons ago, I became acutely aware of the majesty and shear terror that NSA embodies. As spouse to someone who was in intelligence at the time, the credit union we used was on that campus. 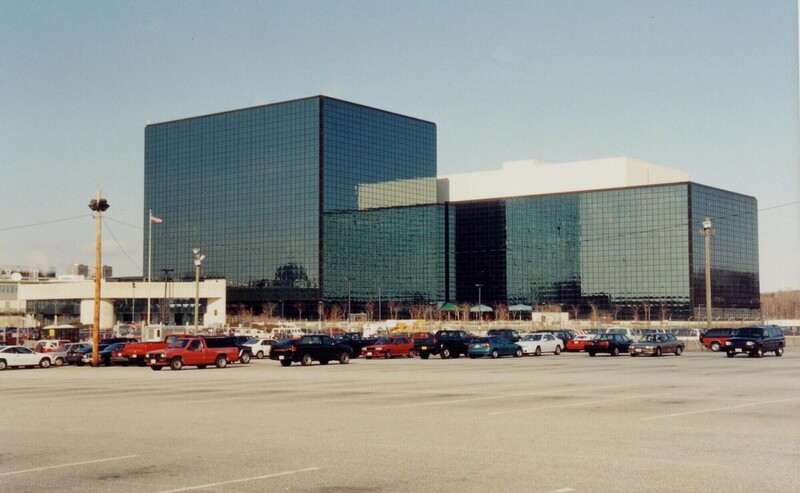 When you see photos of the green/black glass box of NSA, you will see the wing off to the left. Each time I would park and walk through the maze of concrete barriers, massive fences and concertina wire, I was VERY aware of the fact that I was being watched as soon as I drove up. For each step through each layer, even after the approximately ten steps it took me to get in the front lobby and turn left into the credit union and after. I know they do things I don’t like but I also know that people are doing that all around the globe. That changes who you are. I am always shocked when I see stories about the TSA and the furor over the body scanners and anything else the government does. Yesterday there was a massive information dump about NSA…from phone monitoring to social media data mining. Everyone is freaking out and it has just made me laugh with the humor in that. HOW DOES ANYONE THINK THIS ISNT ALWAYS HAPPENING? Seriously, there are viruses and hackers, how do you think ANYTHING you do online is secret or protected? Granted there are ways to go incognito, hide and in general shield yourself but many people don’t know how, or don’t think to do that most times. You guys know photos contain info when you post them, right? You know I can Google you, not just your name but your most used email addresses and usernames, and instantly see anything you are talking about or have been recently? Do you know how frequently you are filmed on any given day? Why would you think that the government would not be doing the same? In times such as these, I am reminded there is a lot people don’t think about from our history. Most of you know about the Tuskegee experiments (I hope) and maybe Guatemala? Do you know about our long-standing and still occurring involvement in Latin America? J. Edgar Hoover? Maybe because those things didn’t effect you or your family personally you didn’t notice the over reach? Maybe some were so long ago you don’t consider them relevant? Have you ever seen the map that shows where we have troops currently? If not, your best guess is what, four countries? HAHAHA. Try 162 countries. What exactly do you think our “mission” is in that many countries? We live in a global society even when we don’t view it that way, it continues. Post-9/11, it is even more so. You can shake your fists at the idea, you can march, protest, etc. but the reality is, you will not stop the collection of information at this scale unless you shut down the Internet and cell services. All in for that, raise your hands? In the 80’s on AFN, a series of Op Sec commercials would run daily to indoctrinate civilians and military members and keep you from giving out information. Every time I see something reported on the news, I cringe when details are broadcast because it affects a lot more than you can imagine. I felt the same cringe when the details of the current NSA programs were released. As much as you have people leaking information you will continue to have a government bureaucracy that will collect it. It happened before Bush and will continue after Obama. It has zero to do with what party is in power because there is support from all sides. Despite my liberal leanings, after attending a weeklong training in security policy one year, I understand why it’s done the way it’s done. It is irrelevant if I agree. If you don’t use diplomatic and super secret squirrel methods more frequently, that means boots on the ground in other countries, which increases the instance of something going bad really fast. I think that “boots on the ground” don’t matter to a lot of people. There is a lot of flag waving and yellow ribbons but not a true understanding of what happens to the men and women in those situations. We will not end terrorism. It is just as naïve to think that, as it is that you will prevent the government from monitoring whoever they please. There are people that live with bombs going off every day in their countries and then there is each of the citizens in the US, who are always so surprised when it happens here. I am never surprised when it happens, only surprised that it’s not more frequently. I guess that’s why I don’t get twisted about this stuff. If someone needs to monitor, in whatever form, some guy in my neighborhood because they think he is plotting a terrorist crime, I am okay with that. I have kids, I want to protect them. Most people would say the same thing to you. A very wise professor once told a group of activists that you are often already on a “watch list” when you belong to any special interest group because you are actively working to change some particular policy. The government believes that these groups are where extreme beliefs can spark. I don’t disagree with that because over the years historically, you can point to that in a number of countries. He went on to list some such as NOW, NARAL, LULAC, and NAACP and told stories of how he found out he was on a watch list. Having belonged to some of these organizations and many others, I was hearing what I already knew. It didn’t matter if I opposed this treatment. It didn’t change the fact that I would still work groups and push for the causes that I felt most important. All up in arms about government monitoring? Support candidates that vow to get rid of it. Oh and please, let me know when you find one that will actually do it. I would love to work for them too. I really appreciate this perspective. I am also fairly left of center. In terms of my personal online standards, I have kept to the rules my beloved Grandma taught me – I think to myself that EVERYONE (Grandma and the government included) is watching. Although . . . I do recognize this likely restricts what should be a healthy dialogue online. Thanks for this food for thought.